Blue was the first to arrive with Pink, who had come specially to celebrate our sixth birthday. While they were waiting for food they managed a quick game of NMBR 9. This is a very simple game, almost like Tetris where players try to tessellate tiles, building layers on top of layers, with the higher layers scoring more points. It is almost a year since Blue and Pink picked it up at Essen, and since then it has been played repeatedly, an average almost once a month (or every other games night). 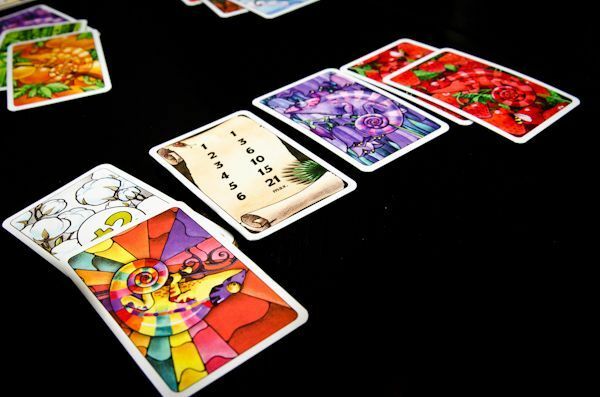 Mostly we aren’t so keen on multiplayer solitaire games like this, but NMBR 9 is the exception largely because it is so very fast to set up and games are quick to play too making it a great filler. It is a shame it only plays four, because there is no real reason that it couldn’t play a few more. Food arrived really quickly, and we were still placing the final tiles. It was quite close with similar values for the “first floor”, but Blue edged it with a four and a nine on the next layer compared with Pink, who only managed a six. Burgundy arrived soon after, and attacked his ham, eggs ‘n’ chips, eventually followed by Pine, Ivory, Green, and Cobalt (a friend of Green’s who will be moving into the village in a few weeks time). As it was exactly six years since the first games night, we couldn’t let the night pass without some sort of small celebration. So this year we had chocolate brownie cupcakes adorned with meeples to go with the now traditional, the “Birthday Feature Game”, Crappy Birthday. This is a very silly game that we now play exactly once a year at the beginning of October, with some house rules to make it slightly more palatable as it really isn’t our sort of game at all. Strangely though, everyone seems to really enjoy playing it once a year on our birthday. The idea is very simple: everyone has a hand of gift cards, and everyone takes it in turns to “celebrate their birthday”. On a player’s “birthday” they receive a gift from everyone else. These are shuffled, and the “birthday boy” picks the best and worst – the players who gave these get a point and after one year (i.e. after everyone has had a “birthday”), the player or players with the most points win. It is the cards that “make” the game for us: they are brilliant with fantastic comments. For example, Pink was tickled, well, pink, by the “pet vulture” that he gave to Pine, which was “very friendly, but stares at you while you are sleeping”. Pine was quite taken with it too and picked it to be his favourite gift, to go with the “fresh turkey” which was always going to be unpopular with a vegetarian (though might have given him something to feed to the vulture). Burgundy showed an unexpected desire for a set of fluffy dice (thought that might have been more due to the nature of the other gifts than their actual desirability), and Ivory returned the “thoughtful gift” of a set of “camera scales”, which he felt would have been off-putting. Despite his love of Star Wars, Green decided he’d rather have “a suit of armour” than a complete collection of memorabilia . Star wars wasn’t in favour with Cobalt either as he unceremoniously returned the gift of “a Star Wars themed wedding” (though it wasn’t completely clear whether it was the Star Wars theme or the wedding that he was rejecting). There was a brief hiatus while Ivory entertained everyone with a complete rendition of Rod Campbell’s “Dear Zoo” story. Despite being written over thirty-five year ago, nobody else seemed very familiar with the story and everyone was spell-bound as Ivory explained, “I wrote to the zoo to send me a pet. They sent me an elephant, but he was too big, so I sent it back.” A very long list of animals later, we established that the puppy was just perfect and Crappy Birthday continued. The game finished with Pink who fittingly received a real birthday card (it really IS his birthday soon). Blue then tried to persuade him that Chernobyl was now a safe place to visit and full of lots of interesting wildlife, but he wasn’t convinced and much to everyone’s surprise, rejected a visit (and possible nuclear suntan) in favour of “twenty tanning sessions”. With Crappy Birthday done and people just licking the last of the icing off the meeples from the cupcakes, it was time to decide what to play next. Pink was very keen to play either Altiplano or Clans of Caledonia and Ivory and Burgundy were very keen to join them. Time was short and the games are similar lengths, however, Blue, Pink and Burgundy had all played Altiplano, and with it’s similarity to Orléans, it was felt that it would be easier for Ivory to pick up quickly. On the next table, everyone else was trying to decide what to play. With Cobalt new to the group and not able to stay late, they needed a short game that was quick and easy to explain that might be a good introduction to gaming, so in the end, the group settled on Coloretto. The game is very simple, with players drawing a card and adding to one of the available “trucks”; each truck can take a maximum of three cards. Instead of drawing a card players can take a truck and the round is over when everyone has taken a truck. The aim of the game is to collect sets of cards, but while the three largest sets score positive points, everything else gives negative points. The really clever part is the score which is based on the triangular number series, so sets score increasingly well as they get larger (or badly if they score negative points of course) . Cobalt quickly got to grips with the game, but played it safe by taking the bonus score cards. Pine went for a specific set of colours and Green ended up with several that he could build on. As the game progressed, Cobalt continued to play cautiously and kept the number of colours he had small. Green had several colours, but a few sets were building to a significant number. Meanwhile Pine’s attempt to keep to specific colours was failing and although had lots of one colour, just couldn’t get the others he wanted. The final round featured a golden joker which took a little while to work out the rules for. Despite being very pretty, it turned out that it wasn’t such such a good thing after all, especially at the end of the game. Pine ended up with it and took another random card, which didn’t help him, but didn’t hurt him either. It was very close, but in the final scoring, Cobalt’s cautious approach kept his negative points down to just one, but his positive score had also suffered. It was Green that topped the podium though, with five points more than Pine. Cobalt and Green were chatting while Pine was side-tracked by the eye-catching alpaca on the neighbouring table. Eventually Cobalt called it a night, and Green and Pine contemplated playing something and had just decided to play a quick game, when Black and Purple arrived. They were delighted to find that cakes had been saved for them (with suitably coloured meeples), and the foursome settled down to a game of Splendor. This is another light, set collecting game that we’ve played a lot. With simple choices, we find it a relatively relaxing game to play and perfect in the circumstances. The idea is that players use gem tokens to buy cards, which in turn provide permanent gems that can be used to buy other cards. 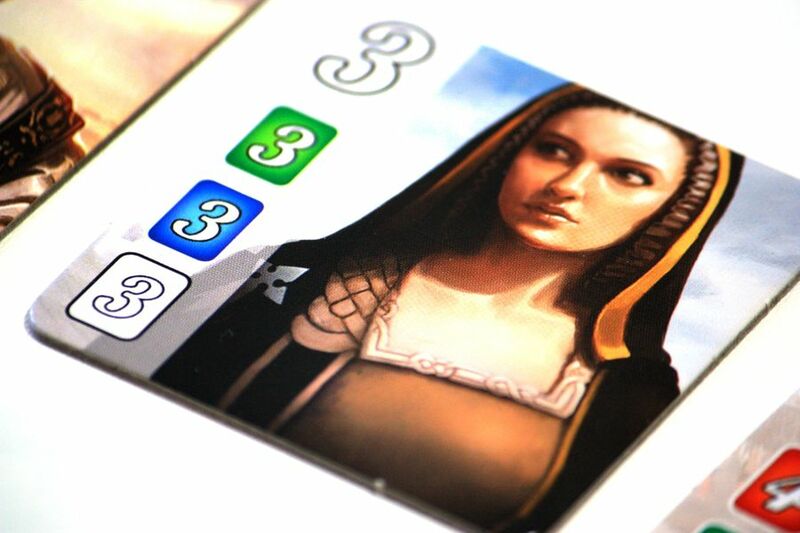 Some of the high value cards also give points and players who collect enough of the right gems may earn a visit from a Noble giving them more points – first player to fifteen points is the winner. Everyone followed their own strategy, but it looked like opal (black) and diamond (white) gem cards were the ones that everyone would need due to the Nobles and very few blue sapphires and green emeralds. Purple managed to corner the market for diamonds causing everyone difficulties. Green was building up red rubies and opals and also going for high scoring cards and Black was managing to gain lots of opals and was quietly beavering away. Pine seemed to find himself in all sorts of trouble as he just couldn’t get the cards he needed with everyone else nabbing them just before him. It was beginning to look like Black was going to win, but suddenly Purple’s hoarding of diamond gems paid dividends as she was able to grab nobles one after the other and reached the magic fifteen points before anyone else, and exactly one turn ahead of Black as it turned out. Meanwhile, on the neighbouring table, Altiplano had been going for some time. It had been the “Feature Game” a few weeks back and everyone had really enjoyed it as it gave a new spin on the “bag building” mechanism used in another game we are very familiar with, Orléans. 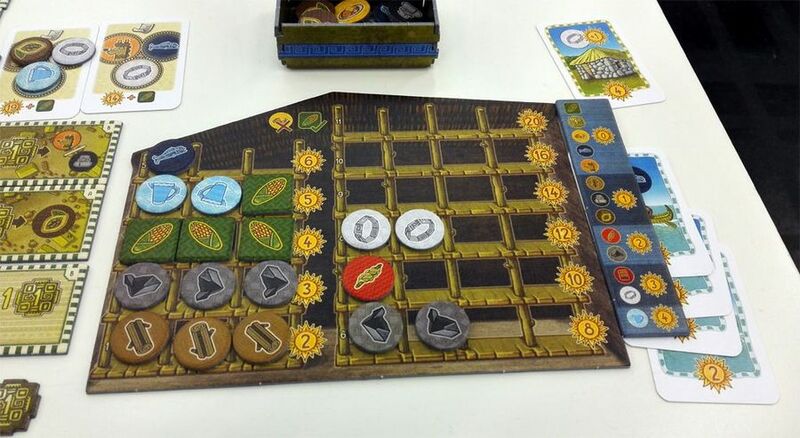 The games are similar in that each player has their own player board, draws “workers” out of their bag and then plays them onto their board before everyone takes in it in turns to carry out the associated actions (one at a time). 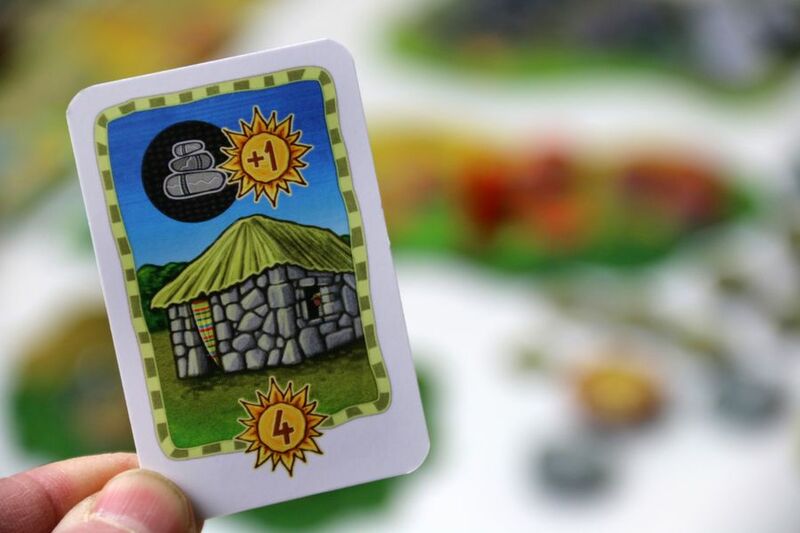 The biggest fundamental difference between the two games is that in Altiplano, when tokens are used, they don’t go straight back in the bag as in Orléans, instead, they go into a separate box. The tokens then only go back into the bag once everything has been used and the bag is empty. This reduces the lottery element and as a result the game is a lot less forgiving to a poorly controlled bag, but players have much more control if they can find a way of using it. The games are visually very different too, with everything set out on a central player board in Orléans, which also features a map which players are trying to navigate and build on. 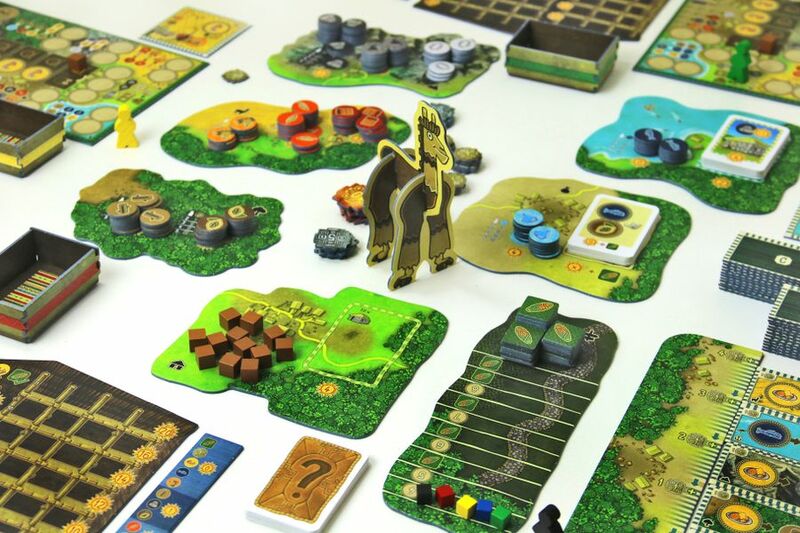 There is no map, in Altiplano, but there is still a spacial element to the game: the central play area is made of locations arranged in a circle and only certain actions can be carried out in each one. 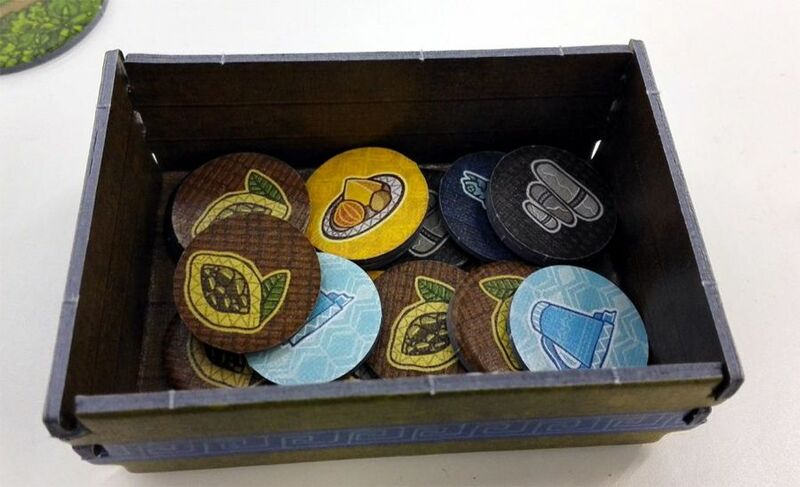 For example, if players want to sell goods, they must be at the Market, and must have the relevant goods placed in the Market spaces on their player board. Before or after their action, players can move, but movement is very restricted. Players begin with one card that can move up to three spaces in either direction, but they can also “buy” additional moves. And this is where we got the rules wrong. The correct rules are that players can place a food token onto one of the movement spaces allowing the player to travel just one space (recycling the food into their box). When these spaces are upgraded with carts, there is still a cost of one food, but now players can move up to three spaces. The rules error was that players couldn’t use the extra movement spaces until they had got a cart, and then they could only travel one space. Blue was sure something wasn’t right, but was too busy checking other things and answering questions that she didn’t get to find what the problem was until the game was nearly finished. At this point, Pink informed everyone that he hadn’t been listening to the rules outline and had just been “playing correctly”. The problem with this is that in a game as tight as Altiplano, even the smallest of changes can have unpredictable consequences. Last time, Green had been taking a token when he bought Cottage Cards (in effect using them as Canoe Cards); although he had only benefited from a couple of extra tokens, he would have been able to use them several times, and as one of them was Stone it would have helped him to get extra tokens out of his bag, and taking the last Glass token ended the game prematurely etc. Thus, in this game in particular it is impossible to unravel mistakes and try to work out what effect it might have had, though both Blue and Burgundy felt they would have benefited hugely had they been able to take those extra moves. Blue had fulfilled more contracts than anyone else and had the vast majority of the glass, but it wasn’t enough. It was very tight between Pink and Burgundy in first and second place though—Burgundy had more goods in his warehouse, but Pink’s were generally of a higher value. In fact it was so close that it called for a recount, just in case. It turned out that the scores had been correct though and Burgundy’s hundred and fifty-two, just edged out Pink who finished three points behind. Comparing the totals to those achieved last time showed how much everyone has improved since the winning score for that game was a hundred and three. The reason for that is probably largely the fact that everyone is getting better at controlling the contents of their bag. As Pink pointed out, it really is critical to get rid of things that aren’t wanted, otherwise you end up in the mess Blue got herself into. This entry was posted in Games Night and tagged Altiplano, Clans of Caledonia, Coloretto, Crappy Birthday, NMBR 9, Orléans, Splendor on October 16, 2018 by nannyGOAT. 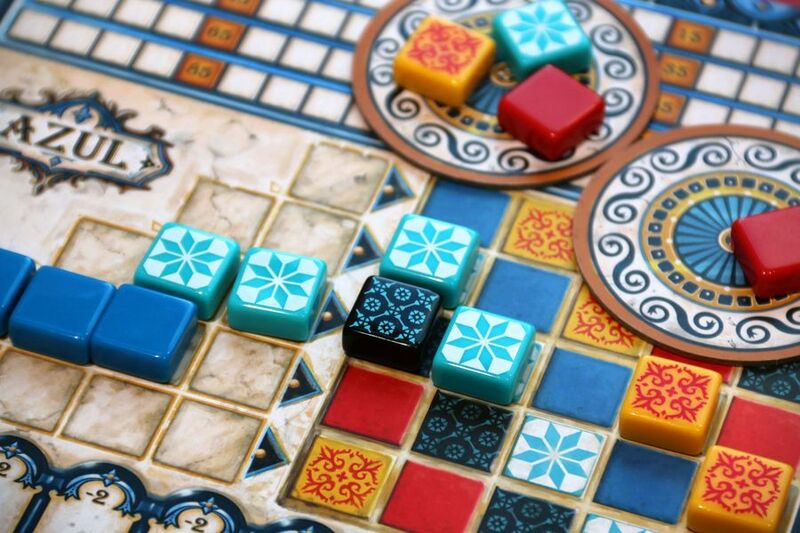 This week the The Deutscher Spiele Preis, or German Game Prize list was announced with first prize going to Azul. 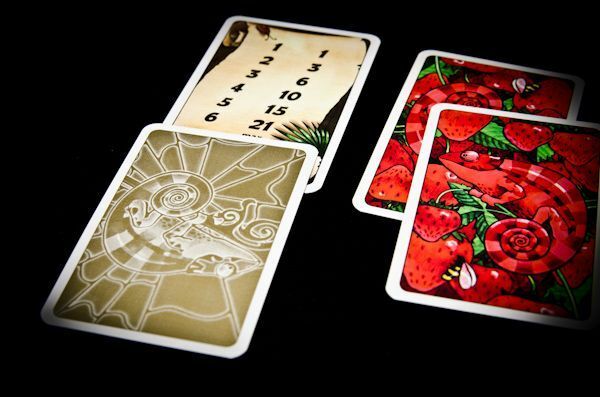 Typically the Deutsche Spiele Preis rewards a slightly heavier game than the the Spiel des Jahres awards, but for the first time since Dominion in 2009, one game took both awards. 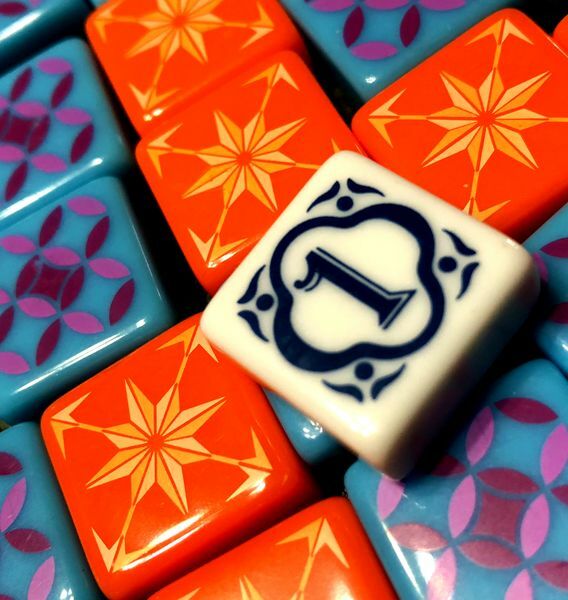 This year we haven’t played many of the games on either list, but our first game of Azul was shortly after it’s release at Essen last year and our local groups have played the spots off it since. So, it is no surprise to us that it has been recognised by both the Spiel des Jahres Jury and the voters from the industry’s stores, magazines, professionals and game clubs, as well as taking the French award at Cannes, the As d’Or and the Origins “Best Family Game of the Year”. Other games that featured on the top ten list included the winner of the Kennerspiel des Jahres award, Die Quacksalber von Quedlinburg (currently only available in German) and one of the runners-up, Heaven & Ale. The Mind, which received a nomination for the Spiel des Jahres Award, also featured in the top ten, as did the inevitable Pandemic Legacy: Season 2. 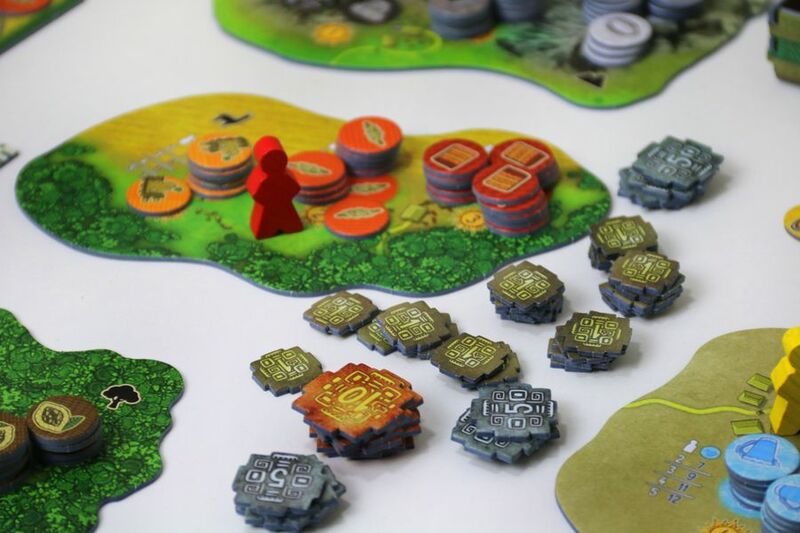 Other than Azul, the only game we’ve played is Altiplano, and that squeaked in at number ten, but Rajas of the Ganges and Clans of Caledonia may feature in the not too far distant future. The Deutscher Spiele Preis for Best Children’s game went to Memoarrr!. The prizes will be awarded at the International Spieltage, Essen. This entry was posted in News and tagged Altiplano, Azul, Clans of Caledonia, Die Quacksalber von Quedlinburg, Dominion, Heaven & Ale, Memoarrr!, Pandemic Legacy: Season 2, Rajas of the Ganges, The Mind on September 22, 2018 by nannyGOAT.